Popsicles are enjoyed by both grown-ups and kids on a hot summer day. I usually prepare these hand-held treats at home as they are kid friendly. This time though there was a little twist to these treats. They were not sweet but savoury. Yes you read it right! Savoury ,,, beacuse I made them from popular Indian beverage "Pudina Chaas". 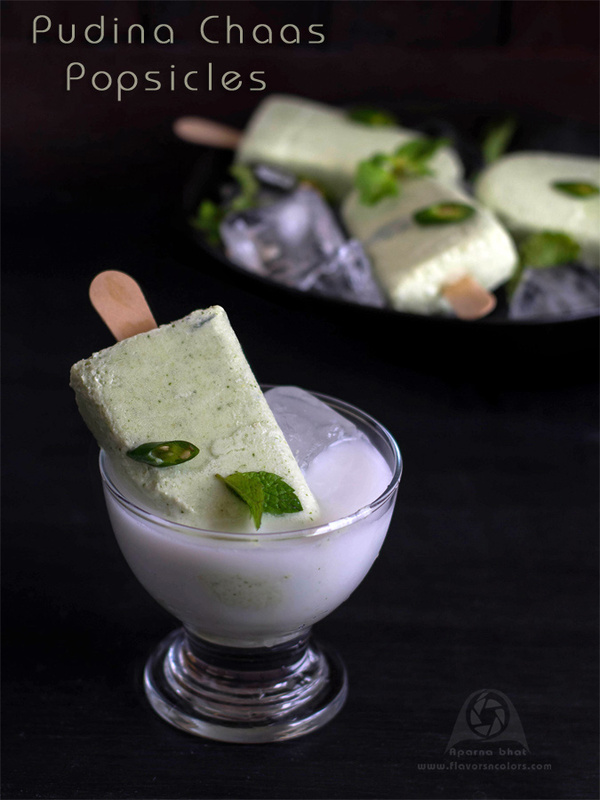 Simple, delicious and inexpensive, just prepare pudina chaas, pour into popsicle moulds and freeze them. Kids enjoyed this frozen concoction and I didn't mind they having two at a time. 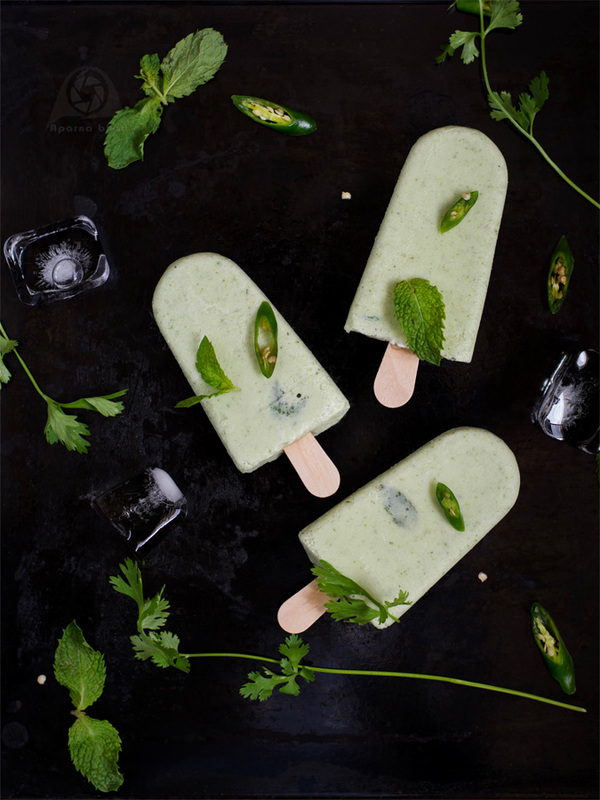 You can prepare your own version of flavoured buttermilk, pour into popsicle moulds and ta da..super cool savoury summer treat ready. The burst of fresh mint flavor and chilli kick with each bite, you will have your family and friends asking for more. Mix all ingredients in a blender except water and blend it smooth. Add water to adjust the consistency. Blend it one more time till you get a frothy mixture. Pour the chaas evenly into popsicle moulds. Cling wrap the mould using an aluminium foil. Make a small horizontal slit with the knife in the center of each mould and place the icecream stick into each slit. If you have popsicle mould lid than use that itself to cover. Freeze them overnight. Next day remove the mould when you wish to eat. Hold the mould at an angle under running tap water. Now remove the foil, gently pull out the popsicles and enjoy them immediately. You may adjust the quanity of green chilli: reduce or exclude green chilies to make it kid friendly and increase if grown-ups prefer a spicy kick with each bite. You may also strain the chaas and then pour it into popsicle mould as per the preference of your family and friends.